We’re excited to have a many time world champion, Rose Bowl champion, and perhaps even the greatest woman player of all time, Kate Dow join us today. Kate started playing in 9th grade, when plans to just toss the frisbee around with a friend turned into seeing people playing freestyle on the Venice Green. She was so mesmerized that she jumped right in and was driven to learn. Several years later, Kate moved her game (& her education) up to Santa Barbara. Competition and winning were bitter sweet for Kate, hear what she says about her experience. She also talks about the perception of men vs. women when they play. Have things changed? The Venice Green and Palm Park are a couple Frisbee mecca’s; Jake & Randy talk about some others. On November 2nd-4th, Jake will be traveling to Ocean Beach, in N. California for the Golden Gate Shred Tournament. A Beachstylers Update – It was originally announced that Jake and Dave Schiller won, however, after a deeper dive on the results, Dave discovered that a rounding error and found that Pavel Baranyk and Harry Skomroch won Open Pairs. Congrats guys! 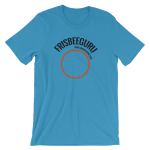 Check out the new photos on the Frisbee Guru Wall of Gurus. Thanks to everyone that’s purchased a t-shirt or contributed.